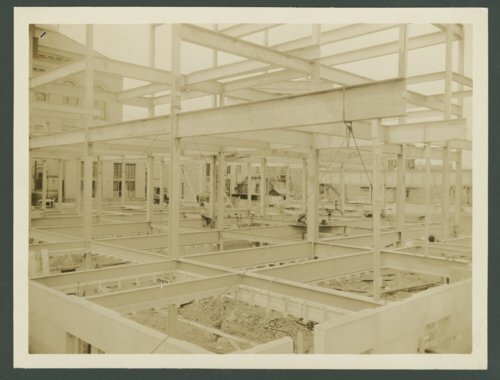 Here are photographs showing construction on the United State Post Office and Federal building located at 424 SW Kansas Avenue in Topeka, Kansas. The contract for the new building was for $608,000, but additions and changes ran the total cost to $615,512.67. Topeka received this building through the persistent efforts of former Vice-President Charles Curtis and Senator Arthur Capper, who urged the necessary appropriation bills through Congress. They succeeded in getting the Federal Building, which resembles the National treasury building, for their hometown. It is finished in Bedford limestone and St. Genevieve golden vein marble. The building was dedicated on December 11, 1933 and was large enough to house all of the Federal offices. People involved in the construction were Frank L. Moore, construction engineer and James I. Barnes, contractor.